Make the Potty Words Stop! Something happened to my sweet little boy when he entered Kindergarten a few months ago. He suddenly became completely and utterly immersed in the humor of body parts and bodily functions. Now, I get that children, especially those with Y-chromosomes, find this stuff funny, but really? Must every punchline be the same? C’mon, kid. You gotta mix it up a bit. It doesn’t help matters that every other boy in his class thinks these jokes are HILARIOUS. With the amount of positive feedback he’s receiving, these jokes are likely to be around for years. He and one of his best little buddies have also started talking lately about punching people’s “butts and weenies.” Which, while making me cringe (“weenies?” ick. ), absolves me of responsibility, as we use anatomically correct terms in this house. (Also, he shouldn’t be talking about doing that.) I made him promise that he would try to cut back on saying it and that he would never, ever say it in front of his teacher. Which he didn’t. Until yesterday. He arrived home after his very first school field trip. “How was it?” I asked, a bit too excited for the occasion. I was horrified. Here was my sweet boy, my Kindergartener no less, being warned about the Principal’s office. My upcoming parent-teacher conference played out in my head. The mortification of having to discuss “butts and weenies” with this woman was too much. Gavin and I had a loooong talk about why the Principal’s office is not a good thing and (yet again) why punching people’s butts and weenies is not acceptable behavior. I think the message resonated quite well for, oh, a good five minutes. But how to make it sink in longer? Is there anything I can do? Or, is this just a normal childhood phase that I need to wait out? Advice welcome. It was my son’s admission that he’d eaten chicken nuggets for lunch every day at school last week that got me thinking about ways to get healthier food onto his plate without the constant battle. Nutrition is a question that worries every parent I know. How do we ensure our picky kids are eating enough? Are they getting the balanced diet they need? And what if, heaven forbid, they go on a boycott of all foods colored green? We reached out to parents and nutritionists for tips on getting those notoriously picky eaters to do just that: eat. Serve meals in courses. Break meals up into smaller courses and start with what you want them to eat most. When her kids were little, Ruth Grau began their meals with a fruit or veggie course. When they finished their fruit or veggies, they would have a meat/protein course, followed by an optional carbohydrate course. The result? “My kids now eat everything and love veggies!” says Ruth. Earlier today, I left my site statistics window open at the dining room table as I went to get Gavin a cup of apple juice. As I was in the kitchen I heard from the dining room “Daddy, I like your painting.” Not having painted anything in about 15 years, I didn’t know what he meant. Returning to the dining room, apple juice in hand, I saw him sitting in my chair happily appreciating the artistic merits of the chart of emails sent by day over the past month. I like the chart too, because it shows that SittingAround is growing. My “Painting,” or notification emails sent by day for the past month. Realizing that he’d never been exposed to visual representations of information before, I though it would be a good idea to give him a quick primer. I expected his attention would last maybe three sentences. Six charts in, having shown him bar charts, spider graphs, x-y plots, and pie charts, I realized he was more interested so I started to probe on understanding. Touche kindergarten child, touche. Perhaps I’ve underestimated you. I ask if he’d like to make his own charts, which gets an excited jumping up and down yes. About twenty minutes and three charts later he clearly felt like he’d mastered the topic and was ready to move on to blowing bubbles on the deck. The following are the charts that we created this afternoon. Scale of 1-10 how much Gavin likes each toy. Notice how he considers my Iphone to be one of his toys. Gavin’s Take on different foods. I think this one is my favorite. Notice how we have somehow convinced him that Kale is the perfect food. Secret to that, I think, is lots of galic and olive oil. Q: What did you think about daddy showing you charts today? Q: What was your favorite chart? Q: What is a chart? I’m a big proponent of explaining things to kids that are beyond what I think they can understand. I figure it primes them to the basic concepts and words for the next time they are exposed to the idea. It also has the advantage of occasionally finding an area where my son’s comprehension is way beyond what I expect it to be, like happened today. If you’re anything like me, you dread the post-Halloween sugar binge. I spend a lot of energy trying to get my son to eat healthy and it becomes so much harder when he’s staring down a bucket of treats. But, not all treats are created equal. The same amount of one candy may be much less healthy than the same amount of another. So, how to choose? 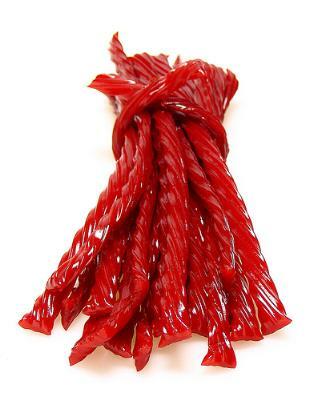 Twizzlers. Our hands-down winner. These long-time favorites are low in sugar, low in calories (compared to other candies), and low in fat. And, they are trans-fat free. York Peppermint Patties. The high mint filling-to-chocolate coating ratio makes these a winner. While mint isn’t typically a kid’s favorite flavor, these patties are sweet enough to appeal to everyone. Tootsie Rolls. The soft, chocolatey comfort of a Tootsie Roll is a low-guilt indulgence. Tootsie Rolls have half the calories of the average chocolate bar and just a third the fat. Smarties. This is one very smart choice. Serving sizes are small, but at 25 calories a pop, you can feel good knowing your kids will still have room for dinner. Kit Kat. If you must have a chocolate bar, a Kit Kat is the way to go. It’s lower in fat than most other bars and is trans-fat free. Best of all, its easily broken into smaller servings and shared. These five options will leave you (and your kids!) feeling better about enjoying a ghoulish October treat. Do you have a favorite Halloween candy? Recently, SittingAround had the distinct honor of being selected by the White House as a “Champion of Change” for the work we’re doing to bring better babysitting to families across America. I went down to DC last month and participated in a panel discussion at the White House, giving advice to aspiring entrepreneurs. I shared my experiences starting SittingAround and why I am so passionate about building community and improving childcare.